The Word of God was never meant to just be spoken. It was never intended to only be recited. Yes, it should be spoken and recited, but its function, its purpose, goes beyond this. In short, the Word of God has been preserved so that believers of God can know how to live in a way that honors the Lord. This is not a dormant message. No, this is a dynamic message. One that yields constant application, value, and meaning. Ezekiel 44:23 underscores the necessity of quality teachers of the Word of God. It succinctly outlines the responsibility of one with spiritual knowledge and insight: to teach what is godly from what is ungodly. To put it another way, model what pleases the Lord and discuss what does not please the Lord. There is a standard for thought and action that God has revealed and His followers are to practice it, and share it with future generations. God’s principles and expectations are well-established, but the area of difficulty is holding to them in a world that yearns to rebel against the holy and mighty One. And this is why quality, godly teachers of Scripture are critical. They can help believers know the difference between what is sacred and what is ungodly. The burden is not just for the teachers of the Bible – it is also for those who hear, and read, the lessons of the Bible. 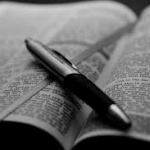 It can be tempting to assume that just because one attends a corporate worship service where the Bible is accurately preached that he, or she, has met his, or her, quota for spiritual instruction. Distracted, or disingenuous, worship is just as much a problem today as it was for Hebrews in the Old Testament. Even for modern-day Christians it can become easy to observe rituals but have no true relationship with God, Who is at the center of the rituals. Meals. Offerings. Service. They can all be done with a distant heart. Obedient observance of worship should flow out of a fellowship with God. Believers should serve because we know Him. Because we actively study, and practice, His Word – the Word that should be taught and lived.